Started in Chicago in 1999, the Cow Parade is the largest public art display in the world. The cows are always the same, but each city/country puts its own art upon it. Most importantly the cows are about charity. After painting and displaying the cows are auctioned off with the money going to chairty. Thirty Four life sized fibreglass Bovine Cows were shipped to the Isle of Man by Cow Parade. The cows designed and painted by young people with the help of professional artists and many were sponsored by an Isle of Man Business or Charity. The Cows were displayed grazing on grass around St Johns during the Tynwald Day Celebrations 2003. The cows could be seen at various places around the Island until September 14th 2003 when they were moved into a 'barn' for a rest before their auction October 9th 2003. The Auction (admittance by ticket only) was carried out at Castletown Golf Links Hotel with the proceeds going to the Golden Jubilee Trust. A last viewing of the cows was held at Ronaldsway Aircraft Company on October 5th 2003 between 10am - 4pm. Cow Parade t-shirts designed by Janet McLaren with green Island image background and Puzzled Cow and Semi Skimmed Moo in the foreground are �12.50 (child) and �15 (adult). Auction catalogues are �10 with photos and background information about the cows. Both items are available at selected venues contact the Tourist Office for more information. 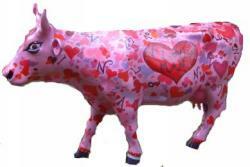 Total money raised from the 33 cows auctioned was �110,200.